At the request of General John J. 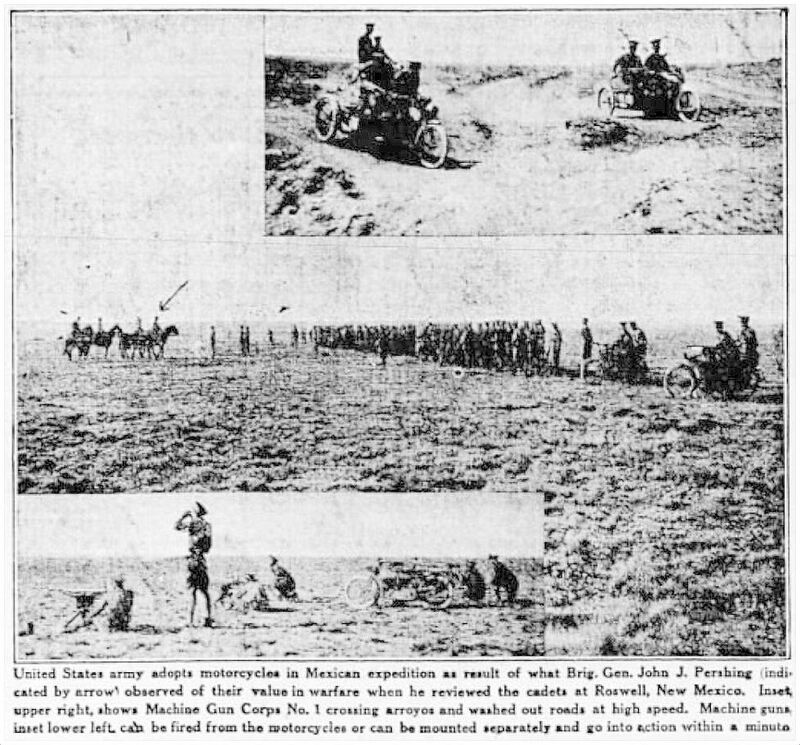 “Black Jack” Pershing, Harley-Davidson sent motorcycles to the U.S.-Mexico border for Pershing’s men to use in dealing with Mexican revolutionary Pancho Villa. This was to augment the handful of vehicles already attached to the First Air Squadron which had been assigned to aid Pershing’s expeditionary forces. This was the first time in American history that both airplanes and motorcycles had been used in a military operation. This photo (seen larger here) shows one of the bikes with a sidecar and portable machine-gun nest, probably taken at Fort Bliss in El Paso, Texas around 1916. …Not much protection for the driver. 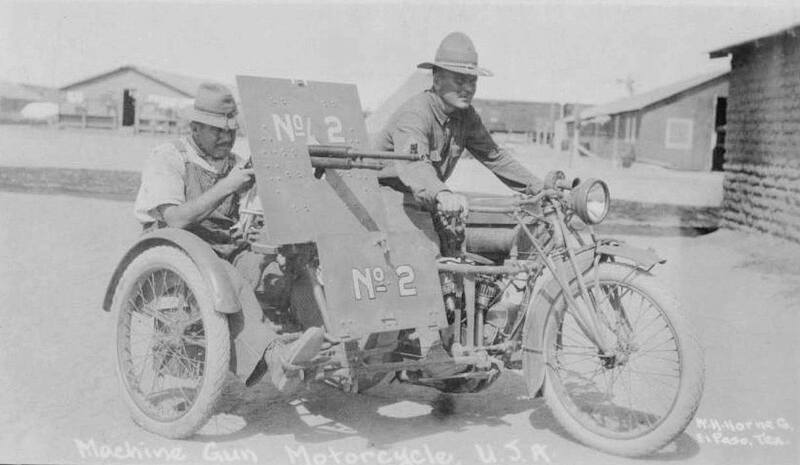 The machine gun company which [Gen. Pershing] reviewed is the first of its kind in America but from the activity displayed by the War Department it is practical certainty that motorcycle machine gun companies will be attached to every regiment. The gun cars and their motorcycle tender carry a total of 4,320 rounds of ammunition in eighteen compact boxes – 240 rounds of ammunition in their flexible belts in each box. [Just] one gunner and driver are required for each gun and in addition the squad carries entrenching tools, wire cutter and complete semaphore signal outfit. 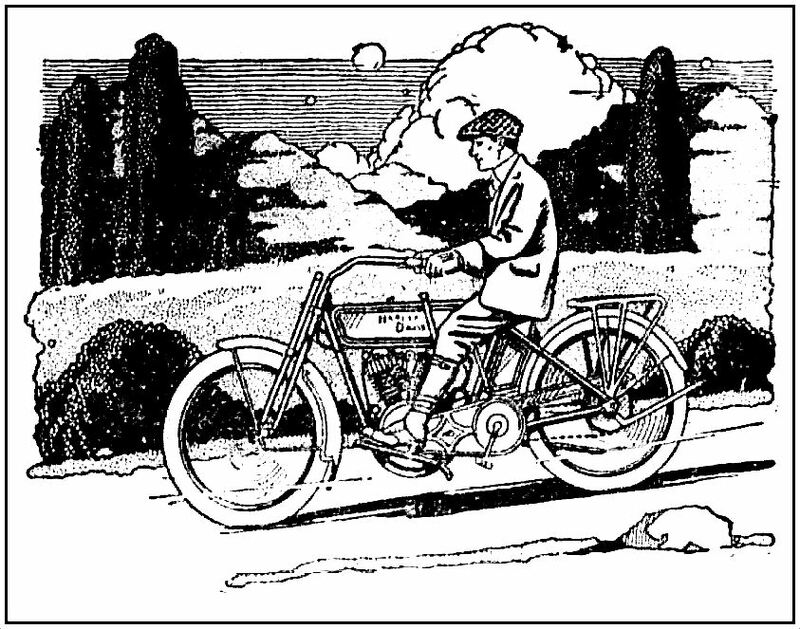 One of the biggest problems with the motorcycle unit (as well as the “aero” squadron) was that there were too few trained men to operate them. Walter Davidson, president of Harley-Davidson, worked closely with the War Department in supplying vehicles and in training men to drive them, but he implored them to consider recruiting men who already had motorcycle experience. Pancho Villa rode a motorcycle himself. No Harley for him, though. He was an INDIAN man. Here are a few very fuzzy news photos of Pershing’s men, several manning the Colt machine guns, in Roswell, New Mexico. 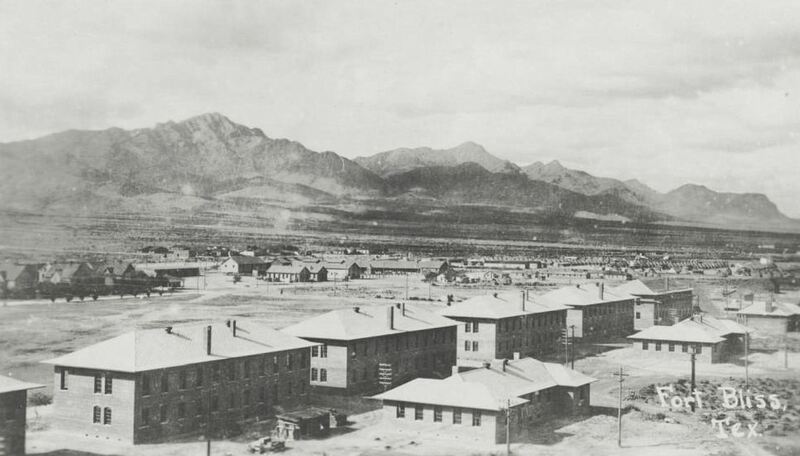 Back to Fort Bliss: here’s a photo of the rugged border outpost and Pershing’s HQ, around the time Black Jack was attempting to secure the U.S.-Mexico border during the Mexican Revolution and chasing Villa (on both sides of the border). 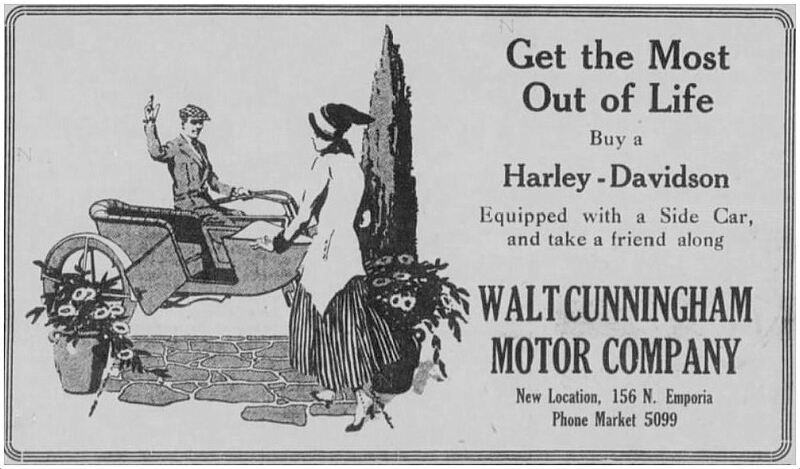 And, lastly, a Harley-Davidson ad soliciting a whole different customer for its cute little sidecars. 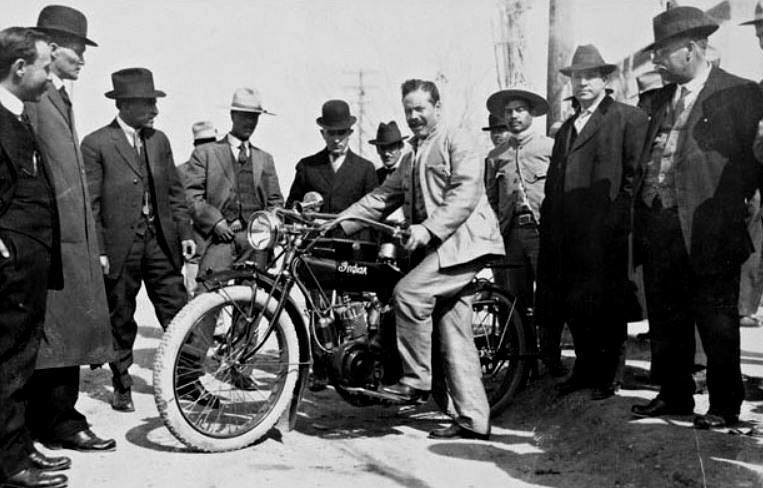 Photo of Pancho Villa with Indian motorcycle found in the article “Pancho Villa, The OG Motorcycle Outlaw,” here. “Fort Bliss, Tex.” photo also from the George W. Cook Collection at SMU; more info on this photo here. “The United States Armed Forces and the Mexican Punitive Expedition” (an article in Prologue magazine, affiliated with the National Archives), here. This entry was posted in 1910s, Military/War, Transportation and tagged Harley-Davidson, Vintage Motorcycles. Bookmark the permalink. Top picture is an Indian, not a Harley!